COMBINE the PHILLY and crushed OREO crumb and mix well. 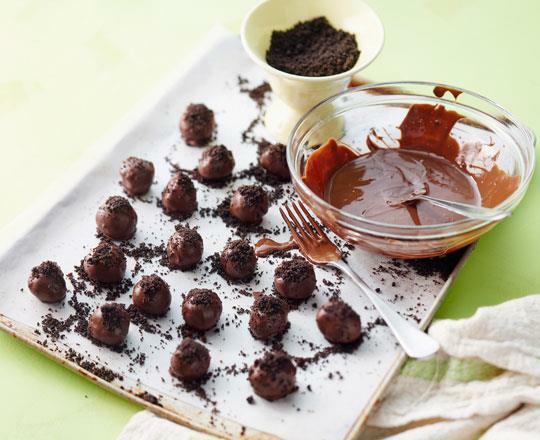 Roll 2 teaspoon amounts into balls, place on a paper lined tray and refrigerate until firm. MELT the chocolate in a MW safe plastic bowl on 50% POWER. Begin with 20 second bursts then reduce to shorter bursts as the chocolate melts, stirring well between each burst of power. Only MW until 75% of the chocolate has melted then continue stirring until smooth. USING 2 forks coat each ball in the chocolate, allow the excess to run off then place onto a paper lined tray. Allow the chocolate to partially set then sprinkle over the reserved crushed OREO. Once the chocolate has set at room temperature, store in an airtight container, refrigerated, until required. TIP: For a festive look decorate with edible Christmas decorations or crushed Christmas candy canes.